Flash Mode: 4 (Constant illumination; All lights flash; Right lights flash; Left lights flash). Healthy&Beauty. pour france. Brightness Mode: 7. Health & Beauty. LED Bead Quantity: 48pcs. Filter Color: Yellow; Blue; Creamy White. This TT685S camera flash applies to Sony DSLR series cameras and is compatible with TTL autoflash. With this build-in 2.4G wireless transmission and TTL compatible flash, your shooting will become simpler. Package included: 1x TT685S Speedlite for Sony(not included batteries) 1x Color Filter Mini softbox(Free Gift) Brand Godox MPN Does Not Apply Compatible Brand For Sony GN 60 Type Shoe Mount Country/Region of Manufacture China UPC Does not apply Features TTL. FEATURESStrong Power and Abundant Functions- AD600 has 600Ws and GN87(m ISO 100, with AD-R6 standard reflector).- Stable color temperature at 5600±200K over the entire power range.- 9 steps of power adjustment(1/1 to 1/256) offer better lights effects.- Fully support High-speed sync (up to 1/8000 seconds), first-curtain sync, and second-curtain sync.Professional Lithium Battery Pack with Great Flexibility- Professional lithium battery pack has large capacity(11.1V/8700mAh) to provide 500 full power flashes and recycle in 0.01. 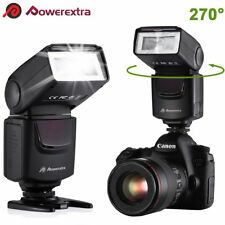 Flash Speedlite 2.4G Wireless Trigger 1 X 2.4G Wireless Flash Trigger. MuIti Flash Mode: The flash will fire at the your setting of output power. The range of output power is 1/128-1/64/-1/32/-1/16-1/8-1/4. This TT685S camera flash applies to Sony DSLR series cameras and is compatible with TTL autoflash. With this TTL compatible flash, your shooting will become simpler. Features: Two Transmitting Styles to Offer Creative Light Effect -Optic transmission with even illumination and stable output -2.4G wireless transmission with all-in-one functions and 100 meters further transmission Master & Slave Flash -TT685S is compatible with Sony Wireless Lighting System (WL). It can function as either an optical wireless master or slave flash. -As a master unit, TT685S can control Sony camera flashes e.g. HVL-F60M, HVL-F43M and HVL-F32M via wireless..
MODEL#HVL-F43M (Black). MULTI INTERFACE SHOE AND QUICK SHIFT BOUNCE, AND ITS MODEL NUMBER ISHVL-F43M. Sony High Power Flash with Quick Shift Bounce. THE BOX HAS BEEN OPENED ONLY TO CHECK CONTENTS. Godox VING TTL Li-on camera flash V860II guarantees better light shooting experience with build-in Godox 2.4G wireless X system, GN60 high guide number, and 20-200 zoom flash coverage. 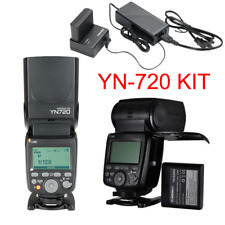 V860II-N applies to Nikon DSLR Cameras and is compatible with i-TTL autoflash. Package Included: 1 x Godox V860II-N flash 1 x Li-ion battery 1 x Charger 1 x Mini stand 1 x Protection case Features: Build-in Godox 2.4G Wireless X System -Optic transmission with even illumination and stable output. -Build-in 2.4G wireless transmission offers all-in-one functions and 100 meters further transmission distance. Full Support TTL Functions. SAMTIAN 18 LED Flash Light 8 adapter Ring 4 Diffuser Ring RF-600E For Sony. Consist of18 pieces SMD LED ,higher luminance and lower static power consumption. Macro ring head 1. Four colors of flash diffusers for alternative use orange,blue, oyster white, and transparent. Sony - HVL-F45RM External Flash like new without box includes case . Used only twice time since purchase in October. Guaranteed perfect working order it's basically brand new without the box. Shipped with USPS Priority Mail. SONY HVL-F45RM External Shoe Mount Flash MINT! I bought 2 of these, was going to use this one for wireless, never did so basically this is a new open box. 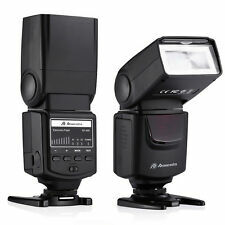 Godox TT600 2.4G HSS Wireless Camera Flash Speedlite for Canon Nikon Olympus#97. Condition is New. Shipped with USPS Priority Mail. REASON FOR SALE IS I UPGRADED. A6000 / A6300 / A6500 / A7 / A7R / A7S / A7 II / A7S II / A7R II / A99 II / DSC-RX10 III / SLT-A68 / DSC-RX1R II / DSC-RX10 II / SLT-A77 II / DSC-HX400V / DSC-RX10 / A3000 / DSC-RX1R / DSC-RX100 II / DSC-HX50V / SLT-A58 / NEX-6 / A99 / DSC-RX1. Sony HVL-RLA Macro Photography Ring Light for DSCF707/F717/F828/V3/R1 Cameras. Condition is Used. But in perfect condition working very well included new battery plus accessories please check the pictures for more details Shipped with USPS Priority Mail. This mini TT350S camera flash applies to Sony Mirrorless Digital series cameras and is compatible with TTL autoflash. With this TTL compatible flash, your shooting will become simpler. Features: Two Transmitting Styles to Offer Creative Light Effect Optic transmission with even illumination and stable output 2.4G wireless transmission with all-in-one functions and 100 meters further transmission. Full TTL Functions Supports HSS (max. 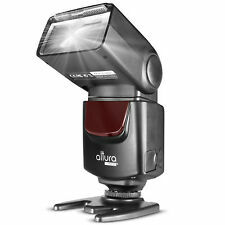 1/8000s), FEC, front & rear curtain sync, multi flash ,manual flash TTL Wireless Flash Trigger X1T-S Offers Better User Experience (Sold separately). Condition is Used. Model: TT350N. See photos to see great condition. Everything works. Original box, case, mini stand, pop out diffuser and white card. Wireless flash function: Master, slave, off. 1x NW630 Flash Speedlite. SUPPORTING FLASH MODE: TTL, Manual, MUTLI, 2.4G MASTER, 2.4 SLAVE, S1, S2. Wireless Flash: 2.4G Transmission. Wireless Flash Function: Master, Slave, Off. Swinging/Tilting Flash Head(Bounce Flash): 0 to 270 Degrees Horizontally, -7 to 90 Degrees Vertically. Trending at $174.99eBay determines this price through a machine learned model of the product's sale prices within the last 90 days. Sony HVL-F56AM Electronic Camera Flash, EX cond. It is in excellent condition and fresh batteries are included. Also includedis the flash stand and basic instructions for it's use. Height 5.16in. Width 3.07in. Weight 16.58oz. Color Black. 5 out of 5 stars - Sony HVL-F56AM Electronic Camera Flash, EX cond. 14 product ratings14 product ratings - Sony HVL-F56AM Electronic Camera Flash, EX cond. As a TTL-capable unit, the TT685S can also operate as a full wireless master or slave unit with TTL functionality. An integrated 2.4GHz X radio system is incorporated into the TT685S for wireless triggering. It is rated with a guide number of 197' at ISO 100 and the 200mm setting and has a zoom head with a total range of coverage from 24-200mm. Condition is New. Wireless slave TTL functionality using either Nissin's Air System with a range of 98' or Fujifilm's optical slave capabilities. Features:Adopts Godox 2.4G Wireless X-system:-With optical transmission & 2.4G wireless transmission, offers an even illumination and stable power output, giving you more outstanding and creative light effect.-Built-in Godox 2.4G wireless X system, TT600S is compatible with AD360II-C/AD360II-N flash, TT685C/TT685N flash, X1T-C/X1T-N/X1T-S trigger, etc.-In the 2.4G wireless transmission mode, when used as a master unit, TT600S can set its group as M/A/B/C/D/E; when used as a slave unit, TT600S can set its group as A/B/C/D/E. There are 1~32 channels to be chosen.Wireless Remote Control and Triggering:-Utilizing Godox 2.4G wireless X system, TT600S can be triggered and controlled by only a X1T-C, X1T-N or X1T-S transmitter (Sold Separately).-TT600S can achi. Build-in Godox 2.4G Wireless X System -Optic transmission with even illumination and stable output. -Build-in 2.4G wireless transmission offers all-in-one functions and 100 meters further transmission distance. Full Support TTL Functions Function include TTL autoflash, Manual Flash, 1/8000s High-speed sync, Flash Exposure Compensation, Second Curtain Sync, etc. Master & Slave Flash -As a master flash unit to control Sony camera flashes e.g.HVL-F60M, HVL-F43M and HVL-F32M via wireless; -As a slave flash unit under control of Sony camera flashes e.g. HVL-F60M, HVL-F43M and HVL-F32M. .
1x TT685S Speedlite for Sony (not included batteries). If you are satisfied with our service, pls. Package includes: 1 * AD200 flash 1 * Flash light flash head 1 * Incandescent lightning head 1 * Godox 40*40cm Softbox S type bracket(Gift) Brand Godox Number of Flash Units 1 Type Outdoor flash Special Features TTL Bundled Items Battery Total Power (Watt-Seconds) 200 Ws MPN Does not apply UPC 602938083225.